Time to End Design Review? During my twenty-five plus years of working on the design, development, and management of new towns and neighborhoods where quality design is a defining attribute and establishing and chairing nine design review boards, I have discovered one universal truth. Nobody likes Design Review. I mean nobody. Not the applicant. Not the design team. Not the developer. Not the reviewer. We have all been there before, on one side of the design review process or another. The applicant or their design team submits a set of drawings to the design review board (“DRB”). Hopefully, within a few weeks, the drawings are returned to the applicant with written comments and red markups. Before even reading and digesting the feedback provided by the DRB, the applicant briefly looks at the number of comments and red ink and gets upset - both at the design review process and the DRB. If they do carefully read the comments, they might be confused by the DRB’s requested design modifications or perhaps amused by the DRB’s lack of understanding of their design goals and operational requirements. Often, the applicant will send a nasty email to the DRB, call and complain to their real estate agents, or even worse, walk from the project. If they stay with the project, they will try to address the DRB’s comments as best as they can and resubmit the drawings into the DRB’s seemingly “black hole” of design review. If and when the applicant’s design is finally approved, they move forward with a bad taste in their mouth about the entire design review process and perhaps the project as a whole. All they tend to remember is the time it took and the additional cost incurred. Seldom do they mention they may have ended up with a better design that is more attractive and cost-efficient. On the DRB side, they are frustrated the applicant did not seem to care enough about the design of the building and how it could add value to the whole development project. THEREFORE, I FIRMLY BELIEVE IT IS TIME, ONCE AND FOR ALL, TO END "DESIGN REVIEW"
So, without design review, how do you ensure that what is designed and built by others is consistent with your vision, complements what exists around it and adds value to the project? While relatively simple, it takes hard work. You “COACH” instead. 1. They clarify the goals and desired outcomes for the team. 2. They recruit the right team. 3. They develop relationships built on understanding and trust. 4. They provide the team with the proper tools and equipment. 5. They reward success and seek continuous improvement. Most of us are pretty horrible at reading minds, yet too often we ask others to read our minds as to what we want to see designed. An architect will diligently work to come up with a design they think is just what you feel is appropriate for the specific site and community. Only after they get the design drawings back from the DRB with a big red “NOT APPROVED” stamp, do they realize you were looking for something completely different. There are multiple techniques for sharing and clarifying your design vision and expectations with others before the start of the design process. Renderings, illustrations, and scaled models showing the desired outcomes are lovely ways to communicate to a wide range of people and interest groups the desired look and feel of the project. Photographs of design precedents and analogs are also excellent vehicles for sharing with others what you hope to see. As good as these tools are, they are not the best. The best results come from spending quality time with those responsible for designing the improvements. Before the design process even commences, it is best to have an initial, or Orientation, meeting with the design team and their client. An Orientation meeting gives everyone an opportunity to meet each other, assess opportunities and constraints, define what success means, and develop a game plan for a successful collaboration. Robert Stern gave me some very sound advice when I was the just starting out as the Town Architect at Celebration. He said “It’s difficult to review in good design. It’s much easier to design in good design.” The best way to achieve quality design work is to work with quality designers -- those who embrace the collective goals of the community and their client, are talented, and willing to work collaboratively. As a sports coach, you have three basic options for forming a team with good players. You inherit them, recruit them, or groom them. The same is true for a design coach when assembling a quality design team. Sometimes, the client/purchaser will already have a stable working relationship with skilled design professionals. If that is the case, perfect. However frequently, they might be working with a less than ideal design team (inexperienced, lacking the needed skills, desire, passion, or incompetent). In those cases, as the design coach, you must introduce them to and facilitate a relationship with appropriate design professionals. Working with skilled design professionals is paramount if you want to a foster positive and productive design experience for all concerned. If you do not inherit or are unable to recruit the right design team, you must groom them. While very time consuming, as a coach, it is perhaps the most rewarding way to develop a skilled design team. Nothing beats watching a young and inexperienced design professional, filled with desire and determination, start to excel in their design efforts. Not only will the design professionals you groom be able to add value to your projects, but your coaching efforts will also have a multiplying effect as they mature in their careers and continue to add value to the built environment as they work with others. If you have ever watched an NCAA basketball postgame interview, you will witness some remarkable things. You will see a coach either beaming with pride over his team’s victory or have a look of despair that the members of the team may not have achieved their individual and the team’s collective goals. In victory or defeat, players will speak about how much they admire the coach and their fellow teammates. Diving to the ground to get a loose ball or taking a charge from an opposing player was not done for them as sole individuals. They did it for the team. It was for the common good. When people care more about the team than themselves, it is possible for individual players, the coach, and the team to achieve unimagined results. To create incremental and perhaps untapped success for all, a high level of trust and understanding between the coach and the players is critical. If you want to get the most out a team, you need to understand their capabilities and their motivations. What are their strengths? What are their weaknesses? What do they want to achieve? What can you do to amplify their strengths? What can you do to compensate for their shortcomings? Discovering the answers to these questions will not only allow you to gain a better understanding of your team members, but it will also create a foundation of trust. With a foundation of trust and mutual understanding, it will be possible to work together to create incremental value for all. 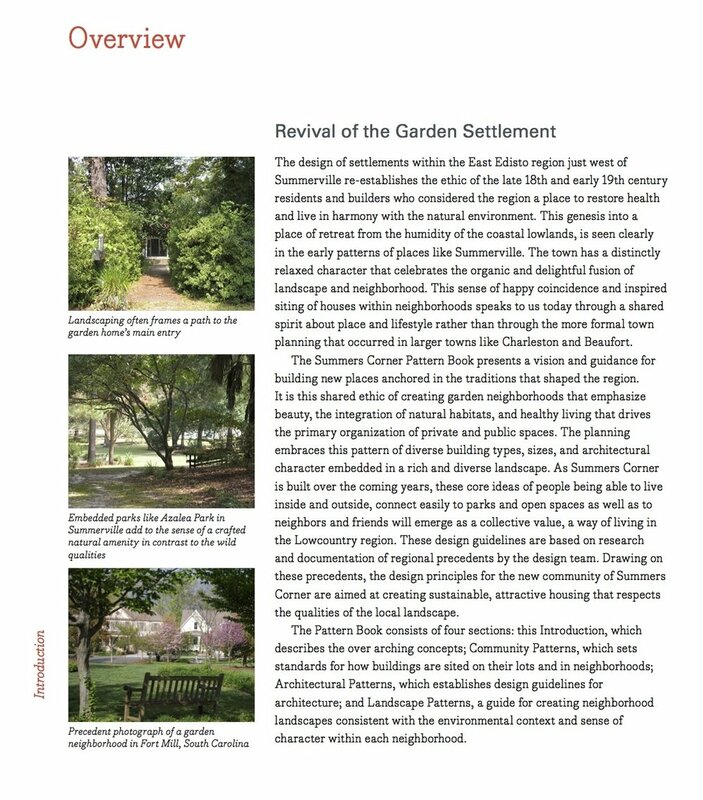 Excerpt From Summers Corner Pattern Book explaining the vision for the community. A well trained and equipped sports team has a better chance of success than a poorly trained and equipped team. Again, the same is true with design professionals. The more information you can provide about your goals and vision for the project, the better. Don’t just tell them “what” you want. Let them know “why” you want it and “why” it is important. To quote the author Simon Sinek, “People don't buy what you do; they buy why you do it.” The more someone is aware of, and can share your motivation for specific design principles, the higher your chances of success. Some of the best training and communication tools I have worked with are the design guidelines developed in conjunction with firms like Urban Design Associates and Hart Howerton. When I was working on Celebration, it was my responsibility to manage the development of the residential design standards for the town. During my review of scores of design standards for other communities, I became extremely disappointed and frustrated. It seemed as if most, if not all, of the design standards I looked at seemed to be written by attorneys. The standards were primarily a set of regulations to be followed. Nothing in these documents was inspirational or aspirational. They read and felt like another form of taxation. I have long been a believer that the more you inspire and educate, the less you need to regulate. With educational and inspirational design tools, the design professionals can be more successful in their design efforts. As their design work improves, the entire community improves. Today, I still get as much satisfaction from a kind word voiced publicly, a pat on the back or a smiley face on a paper as I did when I was in elementary school. Being recognized and rewarded for your hard work is always welcomed. When I receive positive feedback, I feel a sense of pride and, more importantly, it makes me want to try even harder next time. Risking using a “focus group of one,” I assume the same is true for most people. Whether it is an official award, a call to someone’s client or supervisor, or just a kind word in an email or phone call, positive feedback is a great motivator and should never be overlooked. In a world where bad news sells and good news is infrequent at best, recognizing and rewarding good efforts will lead to an increase in positive results. Even though we should reward success, we should not become complacent. We should always strive to make things better. “Good” is okay, but “good enough” should never be okay. Perfection is not an option. However, striving for excellence is. When I was at Celebration, a few of the builders mentioned that one of my most frequent comments to them, or as they put it, a “Top Ten Joe-ism,” was “This looks great! But, can you ask your architect to make this one small change?”. I am sure comments like this became frustrating at times, but in the end, they built houses that were far better and made more money than they could have ever imagined. It is easy to get frustrated when your coach has you run those extra laps at the end of practice, but you do not regret it when the extra boost of stamina in the final minutes of the game is the reason for your winning effort. In a perfect world, there would be no need for design review. People would, on their own accord, work with skilled design professionals, embrace the vision of the community and design and detail buildings that add incremental value to the community. However, we are not in a perfect world. People have varying degrees of skill, understanding, and concern. That said, I have never met a person who has a desire to design and build an ugly building, but ugly buildings pop up all too frequently. Designs still must be submitted and approved, but it is essential to recognize that quality design cannot be “reviewed in.” However, with proper communication, the right people, properly motivated and collaborating to achieve a common goal, it is possible to “coach in” quality design. Joseph Barnes is the principal of Barnes Design & Development Management, advisory services firm. As Community Development Integration specialist, they are dedicated to working with design and development professionals on the creation of built environments which generate incremental and sustained value - aesthetic, social and economic. They leverage the knowledge, lessons learned and relationships developed by Joseph Barnes over twenty-years of experience with benchmark setting, high-profile, high-concept, mixed-used community and land development projects.